Chai is a traditional blend of tea and rich, warming spices from India and Nepal. Using Woozle Magic TM we transform this exotic and heavenly potion into luxurious, aromatic products designed to bring tranquility and peace to your daily bathing rituals. Our complex, proprietary blend of rich vanilla bean, clove, cinnamon, cardamom and black pepper soothe and pamper you from head to toe. Say ahhh, and don't drink the bath water! Think spicy cashmere. Think elegant creamy silk. Our newest addition to the Chai Collection is pure exotic allure. Enriched with antioxidant green tea extract, this age-defying, luxurious shea and hydrating mango butter crème restores and nourishes your skin. Jojoba and Evening Primrose oils, Vitamins E and C, along with botanical extracts help create a rich, penetrating crème high in essential fatty acids, essential for helping skin retain elasticity. So go ahead and revel in your smooth, hydrated and balanced skin. 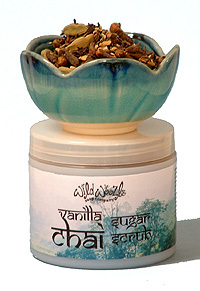 A light hand and body lotion, scented with our fabulous Chai blend. Hemp oil, known for its silkiness and superb moisturizing properties, is said to help repair your skin and stimulate cell growth. With proteins and high levels of essential fatty acids to help skin feel softer and smoother, this penetrating lotion will nourish your skin and please your senses. Take a look at the rest of our fabulous lotions. Some people say our scrubs are better than . . . well, you know. Whether this is true, only you'll know for sure. One thing we'll guarantee is that you'll feel darned good afterwards. We use sugar, traditionally used to aid healing, for gentle exfoliating and skin polishing, rather than the more commonly used salt, which can be drying and harsh. The nourishing oils will moisturize and soften your skin and leave your skin so smooth, you'll feel like you just stepped out of a spa, rather than a shower. Best of all, they won't dry or sting even freshly shaved skin. An exotic shea butter sugar scrub with green tea leaves, ginseng, bamboo extract, and our proprietary essential oil blend leaves your skin spa-smooth and lightly scented. We love sugar scrubs! Take a look at the rest of our selection. Effervescent Attitude Adjustment. Leave your baggage outside the bathroom door. Add a few scoops of our fizzy bath powder to your tub, and it dissolves innocently as you soak up its magical power. Oils and baths salts will soothe your skin and tired muscles while essential oils and luscious scents provide therapy for your mind. Repeat as needed. May we tempt your with more fizzy bath powders? Spa-quality shampoo and luxurious body wash come together for an exclusive, double-duty cleansing gel. Transform your shower or bath into a fragrant hydrotherapy treatment escape, an aromatherapy ritual that's worth getting out of bed for. This select cleanser is enriched with protective antioxidants and moisturizing additives like wheat and oat proteins, Pro-vitamin B, organic and nourishing herbal extracts, including hibiscus, green tea, pomegranate, honey, blue green algae and nettle leaf. Add a little luxury to your necessities. And, of course, we have a couple other lovely spa shampoos. 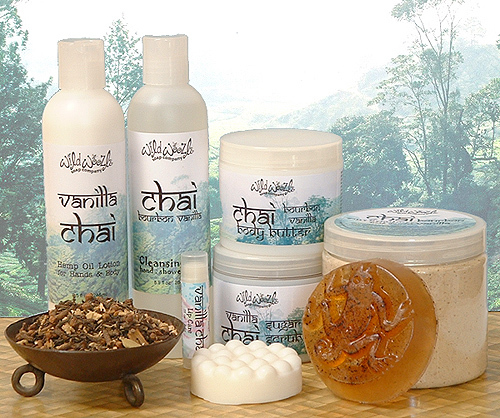 Vanilla Chai Collection save 15%!